Arduino is an open-source, open-hardware project meaning that all the designs are free to use, build upon and reproduce. The name Arduino, however, is a trademark. This means that you can’t just make an identical board and call it an Arduino. The money made from Arduino boards is put back into the community, in ways of research and development of upgrades and new boards. Any money made from clones has a slim chance of ending up back in the Arduino community. Not only this, but you can’t be sure of the quality of the product you are buying. Fake, or counterfeit Arduinos, are direct copies of official boards. They use the same name, logo, branding and design of Arduino boards, and are designed to trick buyers into thinking they have bought an official board. These boards not only infringe on Arduino’s copyright, but have no guarantee to be of any quality, or have any support. It has been known for these fake suppliers to just ship their boards out, and then not replace them when people have any issues with them. Although the fakes can be pretty good at impersonating the real thing, there are always tell-tale signs that you have a fake. Before you even open the packaging, you can tell a fake if it just comes in an anti-static bag. 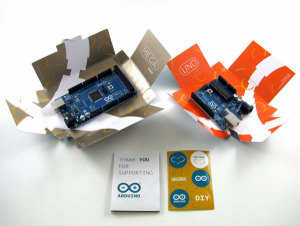 Official Arduino boards come in a box, with some stickers, and a ‘Thank You for Supporting Us’ leaflet inside. Opening your new Arduino should be a joy, not just ripping apart a cheap anti-static bag. After you’ve opened your Arduino, you can physically look at the board and spot some easy to see things that the counterfeiters have overlooked. The first major give-away is the colour of the board. Official boards have a unique turquoise colour – a little bit of green and blue. Fake Arduino boards can’t usually replicate this, and are simply a dark blue colour. The font used on the boards are a custom design. As Arduino do not release the images or fonts, fakes cannot usually replicate the font. If you look at the comparison of the two boards, you will notice the ‘O’ looks quite a lot different on the fake. The logo is also not quite as clear as it could be. The dots around the ‘UNO’ are a little unclear and uneven compared to the original. Another sign is the 501K component near the voltage regulator and USB port. On an official Arduino, this is a custom made component, whereas fake Arduino boards have to make do with an off-the-shelf (and usually green) component. On the rear of the board is a map of Italy, and various other information about the board. Again, the font and the logo are dead give-aways of a fake board. They just usually cannot match the original design. The font just doesn’t look right. Another problem the fakers have is with the map of Italy. The fake in the example to the right doesn’t look too bad, but the map isn’t as defined as the original. Many fakes make errors that are apparent on the map, like having such a bad shape it no longer looks like Italy, saying something other than made in Italy, or missing the map off entirely. What Is An Arduino Clone? An Arduino Clone is any Arduino board that is not an official board, but is an identical replica with a different name. These are allowed under the trademark law as they are not impersonating an official Arduino board. One example of these are the boards by SainSmart (see the image to the right). It’s an exact copy of an original Mega 2560, and doesn’t improve on the design in any way. For all intents and purposes, it’s the same as an Arduino, but with the SainSmart logo. These boards usually do not cost much less, and often do not contribute to the community. To be fair, SainSmart do make other products, but many other cloners simply clone the Arduino and sell it on at a slightly reduced price. Arduino Derivatives are boards that take an Arduino, and build upon it to make a greater product. Many of these projects start off on Kickstarter, such as the DigiX (which adds WiFi to an Arduino Due), and the Teensy, which is a stupidly small Arduino compatible board. These boards often contribute back to the open-hardware community, and create something a little bit special. You have to keep a watchful eye out for what you buy. It’s always best to buy an official Arduino board, as you get the the comfort that a damaged product can be returned, that care has gone into making it and support will always be at hand. If you see something that seems too good to be true, it most probably is. Buying official boards helps the community in the long run. Is it really worth buying a fake Arduino board from China just to scrape a small saving? hi,guys I recently bought an Arduino 2560 mega and soon found out it was a clone but I don’t see the problem it does the same things ,or am I wrong? Hi Rexwer, the schematics for official Arduinos are open source, so if the cloner copied it perfectly, it should work exactly the same. The main differences are that the build quality may not be as good as the original, and the money goes to the cloner, and not Arduino. If it all works fine then you should have no problem. Regarding the Sainsmart clones, I recently purchased a Sainsmart Due card with its nice starter kit full of useful parts and projects. It didn’t have the 10-pin JTAG/SWD header installed. Having rather limited soldering skills I decided to buy the official Arduino Due, *which _does_ have the JTAG/SWD header installed*. Note that this is only an issue if you want to do low-level debugging with a debugger, e.g. gdb. Everything works fine using the Sainsmart Due with Arduino IDE (so far). Buyer beware! How can you have a “fake” or a “clone” of an open source design? You need to go and look at the documentation surrounding Arduino, see what is permitted and what isn’t. Calling out Sainsmart who do exactly what Arduino require, calling their boards SainSmart Uno Development Board, compatible with Arduino, is poor research and understanding of the rules around open source. 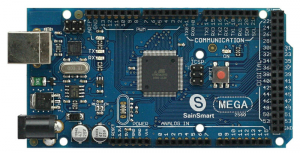 Nearly every Sainsmart Arduino compatible board is different in some way to the Italian originals, which means they are following the spirit of open source. Arduino became popular for precisely this reason -because people have access to the original schematics and can tweak or make to their own requirements. I can buy a $2.50 Nano and blow the s**t out of it experimenting, something I wouldn’t do with a $25 Italian one. A poorly researched article, completely misinforming. Hi Mike, I’m afraid you’re wrong. Arduino have themselves talked about ‘fake’ Arduino boards. It’s intended as buying advice for beginners to help them not get scammed by unscrupulous online retailers, not a blast on other smaller manufacturers. Let’s say a newbie spends $30 on an official Arduino board, but the seller sends them a $3 ‘fake’ from China that doesn’t work (but has the Arduino logo, and looks the same); they’ll blame Arduino, and not the ‘fake’ board manufacturers. I’m not ‘calling out SainSmart’, I’m explaining what they are in relation to Arduino. Again, if someone buys a SainSmart expecting an official board, it may not work as expected, as Michael’s comment above shows!